Patients are in hospital because they are ill, not for a rest or a holiday. But there is no “rest” for patients in hospital these days. If you have a family member in hospital, work the schedule that suits them and you, and stick to it. They will look forward to your visit each day. If you have a friend in hospital, telephone the hospital beforehand to find out if the patient is well enough to receive visitors. Make the visit short. If the family happens to be there at the same time, excuse yourself as soon as you conveniently can. Too many visitors tire patients. NEVER ever visit anyone in hospital if you are unwell and that means sore throats, colds, flu or diarrhoea – keep away. LIAISE with a family member about your potential visit. Don’t arrive in droves like it is a big social occasion. Space out your visits and don’t stay too long. DO NOT discuss the patient’s prognosis in front of the patient if it is not positive. NEVER pick up the patient’s medical records, some hospitals keep at the foot of the bed, and read through them. They are not your property. UNLESS a patient shows a desire to discuss his or her illness, keep off the subject. DO NOT alarm patients by discussing your previous operations and hospital stays. Sick people do not want to hear them, particularly your labour, ladies! CHOOSE cheerful topics to talk about and never say anything that would worry the patient such as ‘wasn’t it shocking dear old so-and-so died in a car crash the other day’. STAND at the bedside to one side, as being a patient can be like being at the tennis with your head going back and forth. LEAVE the ward when the patient wants to use the lavatory – give them privacy. IF a patient has other friends visiting, don’t end up chatting to them and ignoring the patient. People noise, like non-stop chattering, can be overwhelming when you’re ill.
SEE that you confine your visits to the visiting hours. Always be mindful that the patient may not be up to a visitor. NEVER take a friend with you whom the patient does not know. NEVER ever smoke in front of a patient, even if invited to do so. If you take or send flowers, it is a good idea to have the bunch arranged ready to be placed in the vase, or the box ready to be plonked on the shelf; saves nurse time and your floral arrangement. Are you a visitor from another planet? Be quiet. Hospitals are not hotels. Be considerate. Patients in hospital today are a lot sicker. Patients are ill. They need quiet surroundings and consideration at all times. Consider other patients. Don’t think drawing the curtains around the bed blocks out the noise – it doesn’t. Curb the chatter. Visitors chattering away is draining and exhausting when people are ill.
Get off your mobile in the wards. Patients do not want to hear you repeating your family member’s diagnosis and upcoming operation to whomever you’re speaking to. It’s sickening and frightening for patients sharing the ward hearing it. Be observant. Don’t get in the way of medical staff doing their job. Behave. If medical and nursing staff ask you to leave, do so. DON’T visit with a cold and that includes your children and babies. DON’T go touching patients without having given your hands a good scrub and wash your face before you go kissing them. DON’T cough all over a patient – cover your mouth and wash your hands immediately. DON’T blow your nose in front of the patient – go outside and when you do, wash your hands immediately. DON’T use their soap – it may have a deadly superbug on it and you may not only catch it, but spread it. GIVE PATIENTS A HAND… CLEAN HANDS. HELP WIN THE BATTLE AGAINST INFECTION! WASH YOUR HANDS. 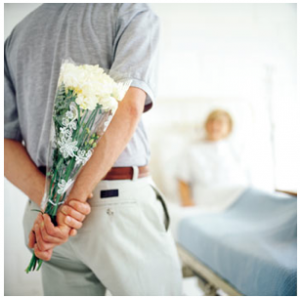 Do the right thing by patients – they are a lot sicker in hospital these days and catch anything lurking around wards. If you see a disaster waiting to happen, e.g. IV drip line under feet, power cord in walkway, sleeve dangling in wheelchair, speak up and prevent a mishap. Safety is everyone’s business.